When Franny (Anne Hathaway), a young graduate student estranged from her family, learns her younger brother Henry (Ben Rosenfield) has been critically injured, she races home to find him in a coma, and her estranged mother (Mary Steenburgen) as flighty and distant as ever. 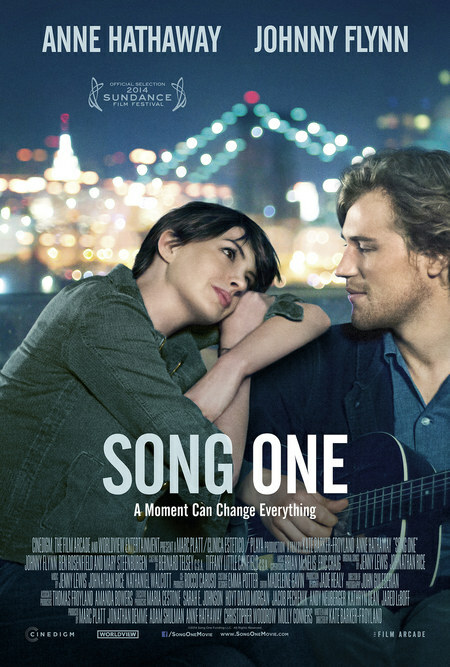 Feeling helpless and alone and with a crazy scheme to try to connect with her comatose brother, Franny takes Henry’s tickets to see his favorite musician, singer-songwriter James Forester (Johnny Flynn), and strikes up a romance with the popular indie-folk musician. Song One, written and directed by Kate Barker-Froyland, features a fantastic soundtrack and cameos from several alternative and indie performers, including Elizabeth Ziman, Dan Deacon and Paul Whitty. Strangely, the film keeps much of this terrific music at arm’s length, focusing on Franny’s face as she listens, or indulging in a few smash cuts in the middle of a song as though it were mere background noise. Had the film respected the music as more than just plot glue, it could have lent some depth to what otherwise is a gossamer-thin story. Much has been made of Barker-Froyland’s coup in landing A-lister Anne Hathaway for her directorial debut. Unfortunately, Hathaway is entirely miscast in the role of the quirky life newbie who is only now beginning to feel her way through adulthood. When Franny sticks shiny bits of paper to the walls of her brother’s hospital room or expresses astonishment that James doesn’t spend his days in important meetings, as she imagines all semi-famous musicians do, it seems more a case of arrested emotional development than wide-eyed wonder. Add to this Hathaway’s trademark moments of practiced imperfection in little bits of business and Franny becomes a deadly combination of irritating and boring. And that’s fatal to a film that is consumed with its obsession with Franny. The camera never leaves her, as though it were afraid she would vanish off the earth were she to venture outside the frame. We’re subjected to an endless series of shots of Franny gazing at the real action off camera: watching her brother, watching the musicians, watching life go by, watching James’ reactions to her adorable quirks, the list goes on. Even when another character is the focus of the shot, a corner of the frame is dedicated to the blurry brown blob that is the back of Franny’s head. With everything in the film about Franny, the real meat of the story gets lost. James’ past is just something to give him a hint of melancholia — that makes him a more authentic musician, you know — while Franny’s mother Karen is the stereotypical middle-aged woman pining for her lost youth. Harry lies near death, but his injuries exist only so Franny can learn important life lessons as she wanders through the heady world of New York indie-folk. The entire endeavor is immature and ridiculous. Song One is not a movie, it’s glorified fanfiction, a thin sketch of a story, albeit one that comes with a killer mixtape.